Warning: there will be spoilers. Don't read this post if you haven't seen the film! I really wish I had written this post back when I first saw Frozen, which was...the week before Christmas? Because then I would have been able to say exactly how I felt about the film. It's been weeks now, so I feel like my review will be a bit more vague than I'd like, but oh well. I'm a lifelong Disney fan, but I'll admit that Disney has had some film slumps. During my lifetime, they had a comeback with the amazing new classics of the 90s, like Beauty and the Beast and The Lion King. But in recent years, it seemed like Disney animated films were hit or miss, and I started relying only on Pixar for quality animated movies. Then Tangled happened, and it instantly became one of my favorites (right up there with Beauty and the Beast). So I had reasonably high hopes for Frozen, but I was worried I might be disappointed. Was I? Not in the least. It was better than I could have hoped for. I am so glad that Disney seems to be making "classics" again. I hope this means they'll continue doing so! First of all, Frozen was gorgeous visually. That was the first thing that I noticed. All of the snow and lovely landscape and the castle, and the whole Norwegian-inspired setting basically, was incredible. In the climatic scene towards the end, I love how the snowflakes are suspended in the air. So pretty! And I love the attention to detail in the animation: the freckles on Anna's cheeks and shoulders, the ice in Kristoff's hair, etc. Also, the characters were awesome. I loved both Anna and Elsa, though Anna was my favorite. Elsa was interesting because they could have easily turned her into a villain, but they didn't. Olaf the snowman was hilarious! I have to admit that I liked him a lot more than I expected to. A talking snowman...I thought he would be over-the-top and cheesy. :) I especially loved his song. I liked Hans so much at first. How could I not, after that ridiculously charming musical number that he and Anna had together? 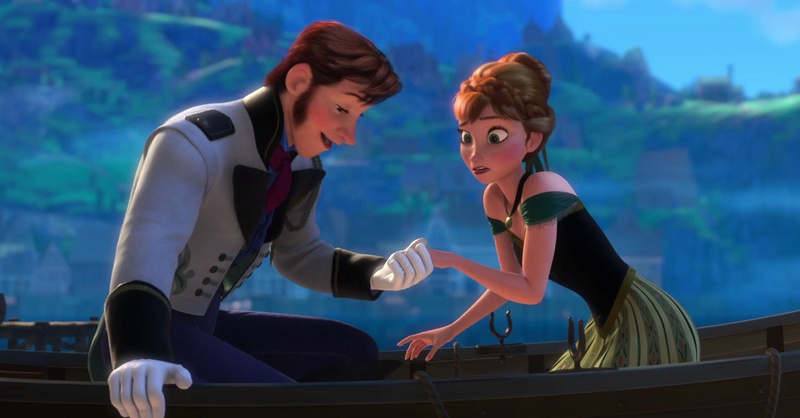 (Love is an Open Door) So when we're introduced to Kristoff, I felt guilty about immediately preferring him, because I had liked Hans so much at the beginning. I kept thinking, where are they going with this? Are they just providing a love interest for Elsa, and if so, how are they going to work that out? But then *bam. * Maybe I'm blind, but I did not see the whole Hans twist coming. At all. After I got over the shock, I was actually pretty impressed with Disney for doing that with one of their male leads. I'm still not sure that I like it, but I am impressed. :) And I guess it worked well in the film. It definitely made for a dramatic ending! And now of course I have to talk about the music. I wasn't too crazy about the song that was at the very beginning of the film. I just kept thinking how much it sounded like a combination of one of the Hawaiian songs from Lilo & Stitch or something from The Lion King. I guess it felt out of place in the snowy setting because it reminded me of those two films. But by the time that choral type of song was used again towards the end, I actually liked it. I have to admit that I feel like there was almost a bit too much music in Frozen. And that's coming from the girl who loves musicals. I still listen to Disney soundtracks and I love classic Hollywood musicals and I don't bat an eye when people randomly burst into song. (In movies, that is. I don't believe I've ever encountered that in real life before. I think I would enjoy it after I got past the surprise. :) But when people start singing their lines, and not just as a transition into a song, but just flat out singing lines that should be spoken, that's where it becomes a bit much for me personally. Don't get me wrong- I loved the songs. Looking back at the soundtrack list now, I don't see a single song that I didn't enjoy. (My favorites were probably Love is an Open Door, Let It Go, and In Summer.) But there was one section of the film (probably about the time when Anna goes to Elsa's ice castle in the mountains?) when it seemed like they were just singing all the time. And maybe part of the reason why it seemed so overwhelming to me is because most of the songs were not exactly the style of music that I generally listen to. They felt really modern, which took me some time to get used to. But now, looking back, I think the music fit the film well. It's a modern classic, and it needs modern(ish) music. 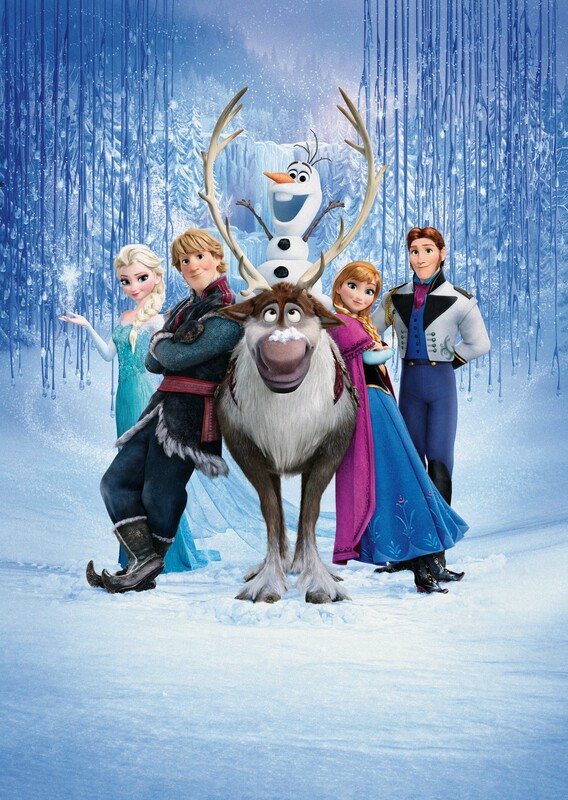 What did you think about Frozen? Do you think Disney is having another "Renaissance?" I was just talking with my brother about this. I haven't seen Frozen but he did and loved it, said it was just like the Disney movies we grew up with. It seems like, for a while there, a lot of kids movies were filled with characters that acted snotty or snarky with jokes that were too mature or rude. It was sad---kids will have their whole long adult lives to be sarcastic, let them be sweet, and enjoy sweet things, when they are young. You and I share much of the same thoughts about this movie, Kristin. The opening music (and ending) was a little... misplaced. I actually said, "okay, this is weird." but fortunately, it got MUCH better and the rest of the soundtrack was pretty if no a bit too frequent. Three cheers for Olaf. Love that little guy. Cannot wait to grab the DVD! It's such a cute movie.